The report also noted, “FCEVs have replaced BEVs as this year’s #1 key trend until 2025.” Yes, you read that correctly – hydrogen fuel cell vehicles top the list as the key trend. Notwithstanding inflammatory commentary by some well-known electric car proponents, Ballard is very excited about the long-term opportunity for fuel cell electric passenger cars. Here’s why. Most people know from personal experience that the global automotive industry is huge. Consider the following two ways to evaluate the size of the market. First, let’s consider the market as a function of the aggregate sales price of new cars sold each year. There are 80 million cars sold each year globally. At an average selling price of US$19k, this translates to a US$1.5 trillion annual market. This is equivalent to approximately 2% of global GDP. Second, let’s consider the total addressable market as a function of the number of miles driven each year. There are 10 trillion miles traveled annually by the global population of cars. At an average cost of US$1/mile, this implies a market size of US$10 trillion. This is equivalent to approximately 13% of global GDP. Here are a few additional facts to punctuate the size of the automotive market. Transportation is the second largest expense for US households, and 70% of total US petroleum usage is for transportation. Consistent with the results in the KPMG survey, we also believe there will be a number of drivetrain solutions to meet differing market requirements and use cases for passenger vehicles. We also believe FCEVs will play an important role in a certain number of these use cases. The heightened interest in electrification, including in FCEVs, is being driven in part by the global movement towards addressing climate change and air pollution through decarbonization. This direction was highlighted in 2017 with several countries proposing or passing laws that would ban ICE-based vehicles. Britain and France each outlined a plan to ban ICEs in vehicles by 2040. India is targeting all vehicles on the road to be powered by clean energy by 2030. In Norway, over 20% of new vehicles sold today are electric and the government wants 100% of sales to be zero-emission by 2025. The Netherlands is also following suit. Germany is reviewing a similar objective. There is indication that the California Air Resources Board is also considering a move toward zero-emission vehicles. China is reviewing a timeline for banning ICEs. In 2017, we also saw unprecedented developments at the city level when 12 of the C40 cities – including London, Paris, Los Angeles, Copenhagen, Barcelona, Vancouver, Mexico City, Milan, and Seattle – signed the “C40 Fossil-Fuel-Free Streets Declaration” – establishing a target of procuring only zero-emission transit buses by the year 2025. Over the next few years, we expect more countries and cities to set up plans to ban ICE-based vehicles. The level of GHG reduction for BEVs is highly dependent on the mix of input power into the electric grid, including the portion of the grid mix that is generated from renewables. When we look at assessing the GHG emissions from extraction of materials and production of batteries, it becomes clear they can also be quite energy intensive. 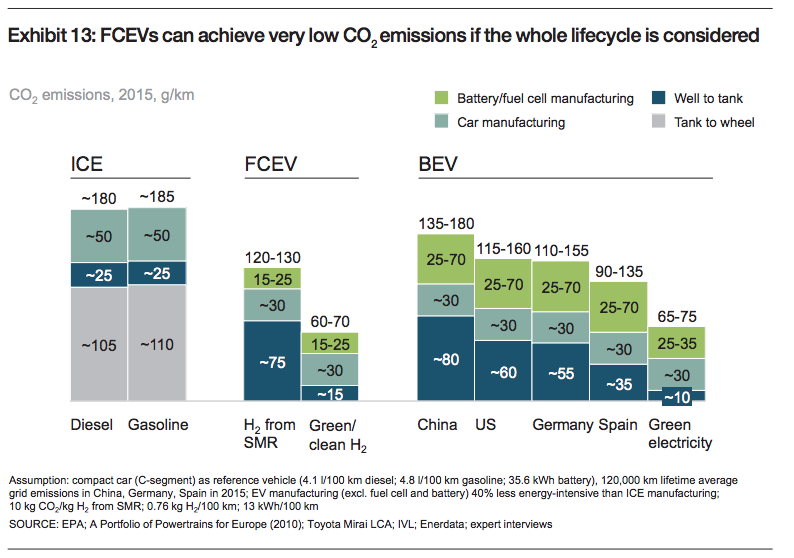 Importantly, FCEVs offer the opportunity for deep decarbonization. Indeed, the most favorable “wells-to-wheels” GHG analysis for passenger cars comes from FCEVs powered by green hydrogen. “Green hydrogen” refers to hydrogen produced from water electrolysis, using renewable power (wind and solar) as the energy input. Utility-scale solar and wind energy are now making this vision achievable, using electrolysis as the link between low-cost renewable energy, stored hydrogen and hydrogen fueling. A number of projects are underway to validate the commercial opportunity for large-scale green hydrogen production based on water electrolysis. In its November 2017 report entitled “Hydrogen Scaling Up”, the Hydrogen Council provided the following exhibit to profile the relative advantage provided by FCEVs fueled with green hydrogen on a lifecycle CO2 emissions basis against ICEs and BEVs. The century-old global automotive industry is facing unprecedented technological and business model disruption. There are four disruptive trends that will fundamentally change the nature of mobility – electrification, shared mobility, autonomous driving and connectivity. We believe these trends are global, secular and converging. We also believe these trends favor FCEVs. Cars are notoriously bad investments. They are typically used only one hour per day, resulting in a utilization rate of 4%. When you consider an average car has 5 seats and an average passenger occupancy rate of 1.55, then you see the utilization rate is only 1.3%. On this basis, we can estimate that a privately-owned EV has a payback approaching 30 years. By contrast, a car used for ride sharing only 10 hours/day (100,000 miles/year) has a payback of less than 3 years. We see the shift from individual car ownership to shared mobility becoming increasingly compelling as utilization goes up and costs come down. We also believe that autonomous vehicles and increased connectivity will further enhance the accessibility and value of shared mobility. The demands on ride sharing cars will be materially different from the demands on low usage battery electric cars in the personal consumer market. With ride sharing, vehicles will require much longer range and will be used for more hours during the day. This means that rapid refueling is a better fit for this segment than long recharging. 1. Slow charging a very large battery at night during low demand periods. The challenges with this approach may include significant weight, expensive batteries, encroachment into passenger space, removal of the vehicle from revenue operation during recharging, and high infrastructure costs. 2. Fast charging a small battery throughout the usage cycle. This approach would likely result in low battery durability due to frequent cycling and fast charging and the depth of discharge cycles, both being heavy stressors. We believe FCEVs offer a more attractive alternative given the ability to meet long ranges and enable fast refueling. It is also important to note that fuel cells are not affected by the number or rate of charge/discharge cycles. China has increased its lead in electric mobility for both market adoption and production capacity. China now has the largest fleet of EVs on the road. This is a result, in part, of generous subsidies provided to the sector in an effort to improve air quality, lower fuel imports and build the sector. Chinese customers can now choose from over 75 EV models. To support this growth, China has quickly expanded its EV charging infrastructure. In some cases, EVs are exempt from license-plate lotteries and significant registration fees that apply for ICE-based cars. Early indications suggest that over 800,000 new energy vehicles (NEVs, which includes BEVs and FCEVs) were produced in China in 2017. The Chinese government has set a goal of 2 million NEVs produced annually by 2020. There is now a major policy push underway in China to advance and prioritize FCEVs. As an example, in 2017, Shanghai announced a landmark initiative for fuel cell vehicle commercialization. The Shanghai Fuel Cell Vehicle Development Plan calls for 100 billion RMB ($15 billion) in annual fuel cell value chain output, including annual production of at least 20,000 fuel cell electric passenger vehicles and 10,000 fuel cell electric commercial vehicles. We believe China will leapfrog Japan, California, Germany, and South Korea in the adoption of FCEVs, including eventually in the passenger vehicle market. We believe the near-term adoption of FCEVs in the medium and heavy duty vehicle markets will serve as a springboard for the long-term adoption of hydrogen-powered fuel cell passenger vehicles. With the call for decarbonization and improved air quality becoming louder, it is notable that these markets typically contribute a disproportionate amount of CO2 and tailpipe emissions. In medium and heavy-duty mobility, there are many use cases where fuel cells and batteries can be packaged and optimized together in a complementary fuel cell electric hybrid solution for high value. This FCEV solution provides a number of key benefits, including zero tailpipe emissions, low noise and vibration, and fast and smooth acceleration. At the same time, FCEVs also provide the additional benefits of long range, fast refueling and full route flexibility, consistent with legacy diesel experience. These additional benefits effectively address the limitations of stand-alone battery electric solutions that are range-constrained, require long recharge times or on-route recharging infrastructure, and may be limited to certain routes. Medium and heavy duty vehicles also present the lowest barriers to entry on hydrogen refueling. That’s because these vehicles typically return back to base at night and can be quickly refueled at a centralized hydrogen refueling station at the depot. We see FCEVs offering high safety, high reliability and uptime, high durability, and high operational flexibility, while also offering the most compelling total cost of ownership economics. In 2017, as part of our journey to achieve the vision of FCEVs in medium and heavy duty vehicles, Ballard issued an industry “call to action”. We named it “30 by 30” – a target of 30% of all new commercial electric vehicles to be FCEVs by 2030. The commercialization of FCEVs in medium and heavy duty markets will help to catalyze adoption of hydrogen fuel cell passenger vehicles, as core technologies and the industry supply chain become more mature. 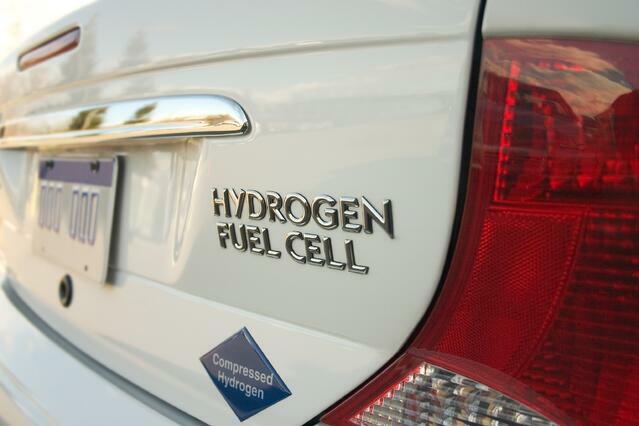 Considerable progress is being made in fuel cell car commercialization. The current generation of Toyota's Mirai fuel cell car has an EPA-rated range of 312 miles. Last year, Toyota planned to deliver 3,000 Mirai, and by 2025 the target is to deliver 30,000 Mirai cars annually. They expect to slash the costs of the fuel cell components by 50% in the next generation of Mirai, which are to be launched around 2020. Toyota plans to eliminate its offering of combustion-engine-only cars by 2025, marketing EVs toward shorter-distance drivers, given the limited range of the cars and the time need to recharge. The company will promote hybrids and FCEVs for long-distance use. Additionally, it is estimated that Honda sold 600 Clarity FCX sedans in 2017, with an EPA rating of 366 miles and 174 horsepower motor. Hyundai recently unveiled the 2019 NEXO fuel cell vehicle, its second generation FCEV, at the 2018 Consumer Electronic Show. The vehicle is being rolled out in time for the 2018 Pyeonchang Winter Olympics. The NEXO is expected to have a driving range of 370 miles, with improved acceleration, power and cold start capabilities. For fuel cell passenger cars, fueling infrastructure continues to gain some critical mass in certain highway corridors in Japan, California and Germany. In Japan, the “Strategic Road Map for Hydrogen and Fuel Cells” report released in 2016 by the Council for a Strategy for Hydrogen and Fuel Cells – an industry body organized by the Ministry of Economy, Trade and Industry (METI) – calls for 160 hydrogen fueling stations and 40,000 FCEVs by 2020, in time for the Tokyo Olympics. In December 2017, a new organization was formed to accelerate Japan’s hydrogen initiatives, and includes Toyota Motors, Nissan, Honda Motor Co Ltd., JXTG Nippon Oil & Energy Corporation, Idemitsu Kosan, Iwatani Corporation, Tokyo Gas, Toho Gas, Air Liquide Japan, Toyota Tsusho and Development Bank of Japan. California currently has approximately 1,600 fuel cell cars on the road, supported by 33 hydrogen fueling stations in operation and another 27 under development. In Germany, there are 50 hydrogen fueling stations now operating, and H2 MOBILITY plans to open and operate 400 stations by 2023. With strong government support, Chinese auto manufacturers are increasingly investigating the merits of FCEVs and discussions are starting on fueling infrastructure plans. Ballard has a long legacy of PEM fuel cell technology leadership, including a strong pedigree in the automotive market. We continue to build on our legacy. Today, we are currently active in approximately 35 Technology Solutions programs that support the development of PEM fuel cell technology, including at the material science, MEA, stack and system levels. We collaborate with a number of global automotive OEMs that offer or plan to offer fuel cell passenger vehicles, including our important partnership with Volkswagen Group, led by Audi. Automotive fuel cell stacks are designed for stringent automotive requirements, including tight vehicle packaging, high temperature operation, long life, low weight, intense shock and vibration, harsh environments and low costs in high production volume. Ballard has developed the necessary technology building blocks for automotive fuel cell stacks, including world leading designs and capabilities relating to anode and cathode catalysts, membrane electrode assemblies, bi-polar plates (including flexible graphite, molded carbon and metal plates), the elimination of cell voltage monitoring, and the use of advanced modeling tools to predict stack performance. We believe Ballard has developed one of the world’s leading automotive fuel cell stacks based on a comparative analysis of key metrics, including stack power density by volume (kW/L), power density by weight (kW/kg), maximum operating temperature (°C), total catalyst (g/kW), freeze start (°C) and durability (hours). We are very confident in the competitive advantages of the PEM fuel cell automotive stack we have developed as well as our next generation of stack. We have high conviction on the attractiveness of the bus, commercial truck, and train markets for FCEVs. We believe we are well positioned to be the leading PEM fuel cell player in these markets. We are working every day to realize the significant market opportunities in front of us. We also see a sizeable passenger vehicle market that will require zero-emission solutions that enable deep decarbonization and meet the requirements of a changing landscape where utilization increases significantly. This will increase miles driven per day and the need for solutions that feature long range and fast refueling. We believe FCEVs will further penetrate the passenger car market within the next five years and achieve high market share within the next 25 years. With our deep understanding of PEM fuel cell stacks for vehicles, including passenger cars, as well as our intellectual capital, intellectual property, technology, partners and brand, we expect significant value will accrue to Ballard shareholders. What are your thoughts on the future of zero-emission transportation? Where do you see hydrogen fuel cell vehicles in the next 5, 10, 20 years? Join the discussion and let us know your thoughts in the comments section below. Or you can send us a tweet at @BallardPwr on Twitter.